This is not really a famous photo as much as it is a famous image. Michael Jackson, an American pop star, was known as the "King of Pop" and here's the dance move that sent him moonwalking to global fame. 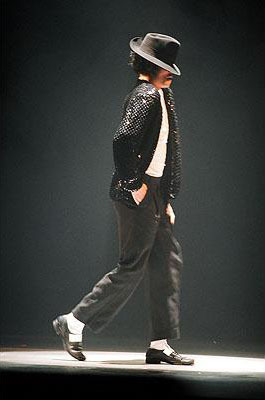 The "moonwalk" is a dance move that creates the illusion of gliding backwards while attempting to move forward. Jackson first performed the move during an appearance on a television special in 1983. It introduced Jackson, who had long performed with his brothers, as a solo performer in his own right who went on to electrify audiences and sell millions of records over the next decade. FilmMagic. Jackson's life in pictures. Accessed 4 August 2010.